It is quite natural that every artist-calligrapher chooses his instruments with great care. Calligraphy demands concentration, coziness and repose. So, following these sets arrange your work place. Better if you have a special desk only for doing calligraphy. Place it near a window with a good day and evening lighting. The desk has to be big enough to place a drawing board and easel (50x70 cm in size) on it, and also paper and instruments. You’d better have a reclinable easel. Have a rough sheet on your desk to test the pen. Calligraphers usually use a smooth glazed paper. A smooth paper better reveals the broad-nib pen and the strokes are more accurate. A good paper inspires the artist. Please, do not forget that before you draw your first stroke on the paper, first examine the whole sheet, try its physical quality. Imagine what there’ll be on this sheet, think how you are going to place elements and symbols and how the blank margins will surround the image. Composition. The more sandal wood bark in the paper, the better. But, the paper which is produced industrially has a very low percentage of sandal wood bark in its composition, even the paper from the most well-known manufacturers. Transparence. The calligraphic paper is distinguished by a nonhomogeneous transparence; if to look through the paper you can see stuffings in the form of a cloud or a peace of cotton. The more such stuffings, the better the paper. Density and smoothness. A good paper has a low-density and a smooth but not slippy surface. To the touch the paper should be smooth and not fragile as a common writing paper. Viscosity. Unfortunately you may feel this quality only when you buy the paper. That is why, first buy a small piece of paper to test it, and if you like the paper you may buy more. The paper should stretch well. A high quality paper is stretched very well. Nonviscous types of paper usually shrivel after writing on them; you can not paste such paper on a frame, and you can not make rolls out of this paper. When such paper gets wet it is easily damaged. Colour. A good calligraphic paper shouldn’t be very white. 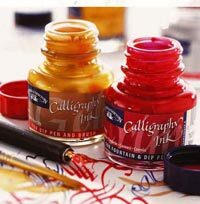 The best colour for the calligraphic paper is the colour of unbleached cotton. Of course, this criterion is not applied to coloured and special decorative types of paper. The best ink is the Bricked Chinese ink. It is usually ground on a special stone or on mate glass with some purified water. This ink softly flows down the pen and has a nice silky tint. Always dilute inks in flasks with water, otherwise the thick ink will leave rough blotchiness on the letters. From time to time shake the flask with ink. You can buy professional colour inks. They easily flow down the pen and have very nice colours. For beginners I have a piece of advice: try to prepare ink yourselves using soot, barks, rinds of walnut and pomegranate, etc. sometimes you will get such unexpected and tender colours which you will never find on sale. Inks differ from each other by the composition of those components of which they consist. Every kind has its own peculiarities in colour, brightness, solubility, etc. Ink can be based on a vast variety of resins and oils – resin of the tung tree, pine, hemp-seed oil and so on. Soot that remains from the burned resin is processed in a special way. Then it is pressed into bricks or bars, and kept from several months to years and more. Very often bricks and bars have a very unusual design and look like small pieces of applied art. On bars one makes embossed pictures of flowers, dragons or birds, gilding is sometimes used. 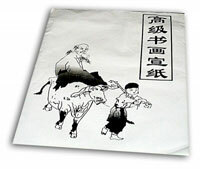 Expensive kinds of ink except for refined design have special cases trimmed with silk, varnish, etc. Before starting work, ink is ground to powder and mixed with some distilled water in a stone ink-pot. While working a calligrapher put his ink on his table on a special support. When the work is over, he dries the ink and put it into an ink-case. Specialists determine the quality of ink according to a great number of characteristics: density, smell, and even a pitter-patter sound. Dissolved high quality ink is dense, a little bit ropy and oily. On the picture you see different kinds of the broad-nib pens, a double pencil, and a peaked pen. The first pens are produced by foreign companies as complete sets, with different width of a writing part (0,5 mm – 5 mm and more). Do not despair if you have not got manufacturing pens. Instead of them you may use pens made from reed or feathers. Kinds of broad-nib pens: 1 – straight cut; 2-3 – right cuts; 4 – left cut for lefthanders; 5 – decorative pen; 6 – pen; 7 – stylo pen; 8 – double pencil; 9 – pointed pen. A brush for writing has a lot of kinds and sub kinds. The differences depend on the material, size, purpose, and proportions of the writing part of a brush. There are three main kinds of brushes: brushes of wolf fur, goatskin and hare fur. In fact wolf fur brushes are made of Siberian weasel fur. There are also mixed kinds of brushes made of different kinds of fur and rare exotic brushes (tiger fur, swan’s down brushes, etc.). As a rule such brushes are made to order. We can single out three main types of brushes: Small, Middle, and Large. Each of these types is divided in its turn into subtypes (sometimes one writes on a brush certain of type of hieroglyphics or style which it is made for). According to proportions of the writing part all brushes are divided into long hair, middle hair, and short hair brushes. Brush holders are usually produced from bamboo or inexpensive sorts of trees. Precious brush holders can be made of porcelain, nephrite, and other rare materials. Very often the working part of a brush is partitioned from the holder by a special inset. It can be plastic or wood (as in modern brushes), and horn or bone (as in exclusive and ancient brushes). On the back side of a brush there is a loop made for the drying of the brush. 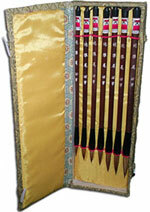 Rare expensive brushes, as a rule, are sold and kept in special cases. Common brushes are usually supplied with a cap which is put on the working part in order not to damage it while carrying. Sometimes expensive brushes are supplied with such caps together with a case as well. Among the “four treasures of a calligrapher’s cabinet” the ink pots possess the greatest variety of forms, materials, and kinds. Ink pots can be with or without lids, light and portable or heavy and stationary. While choosing an ink pot one should pay attention not only on size and form, but also on the quality of the work space decoration. The bottom of an ink pot must be even and well-polished without any cracks or ledges. Together with the art of calligraphy the Chinese made a religion of the implements, “four treasures of a scientists”, - paper, brush, ink, and ink pot. As the latest excavations show ancient inscriptions of the Shan Epoch (16th-11th centuries B.C.) made on tortoise shells bull blade bones first were marked with a brush and then engraved with a knife. Thus, the history of the Chinese brush counts at least 3.000 years. The same is with paper. 2.000 years ago the Greeks and Romans had a lot of trouble with the Egyptian papyrus, but the skilful Chinese quickly got the hand in manufacturing paper from improvised materials – bamboo fibers, some herbals, and rags. Brushes and inks were used in China since the Ist century B.C. (in Europe it was brought into use only in the 17th century). 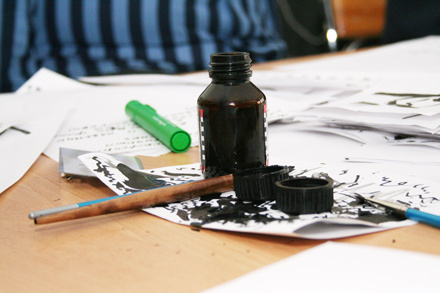 Hard ink was made on the basis of soot which they got by means of pine-wood tar burning with addition of special glue. Into highly qualitative inks musk and cloves were added for fragrance. 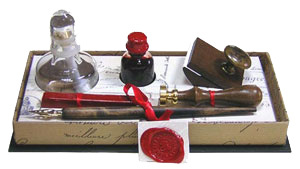 As it became the cult fetish writing materials were considered the most valuable things demanding special treatment.